It's time for one of my favorite "What If of the Week!" questions. Have fun with this! I'd love to hear your ideas. 40 weeks of 9 days each = 360; The extra 5 days +/- would be the major holidays and slide into a week in addition to the 9 days, as appropriate. 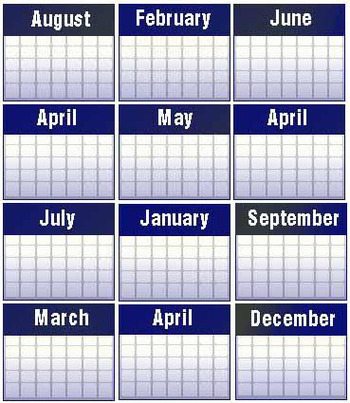 The twelve months would have 30 days each plus whichever of the 5 major holidays fit into several. Benefits? All 3 day weekends - no fighting over the extra day off. 6 workdays per week with 40 weeks greatly reducing "Monday start-up, Friday shut-down" productivity losses. Regular month lengths will equalize accounting periods. Downside? The 7th day is a day of rest is a big challenge! Probably why this concept has not been adopted!! Randy: Some good insights and suggestions. Looks like you've given this some serious thought! I don't work and play and "rest" according to the existing 7-day week. I do these things in 1-3 day clusters or "binges". I'd abolish the existing months--having to remember which months have 30 or 31 days is so silly. Maintaining the 7 day week, I would have 13 months of 28 days and an extra day or two (on leap years) at the end of the year as special holidays (trideskiphobics be damned). These extra days would have no weekday (Monday, Tuesday, Wednesday, etc.) designation. The one that takes place every year would simply be New Year's Eve and the extra one that takes place every four years could be "Leap Day." I'd plug both of these on at the end of the year. So, every year would start on Monday. Every month would start on Monday for that matter. If it's Friday, you know it is the 5th, 12th, 19th, or 26th of the month. You get paid every 2 weeks or twice a month? It doesn't matter -- it is the same thing AND you get paid on the same day and the same date each month. Independence Day would, of course, be celebrated on the 4th, in order that it should be on a Thursday each year -- four-day weekend. Christmas could remain on the 25th -- a Thursday -- another four-day weekend holiday. Let's make Thanksgiving on the 25th every year as well, to the same effect. Valentine's Day, if kept on the 14th, always ends up as a Sunday, which seems a good day for these and Mother's Day. We'll move Columbus Day, President's Day, Memorial Day and Labor Day to fall on Fridays, so those who get them off will get long holiday weekends to sleep off whatever celebratory hangovers they might acquire. Taken on a grand scale, it would involve big changes for business, government, industry, schools, and family life along with cultural and religious customs. It would threaten many, but it would create more productivity and more time off for liesure activity. I've always thought that the New Year should be the Winter Solstice. It just makes sense for the Northern Hemisphere. The Days stop getting shorter and the days begin to grow again.